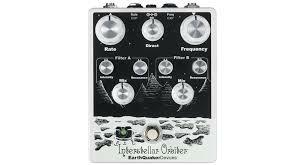 The Interstellar Orbiter is a knob twiddler's dream with loads of possibilities! It can do everything from wah emulation to complex vocal formant filter and even a fairly convincing rotary speaker effect. You can set the intensity of both filters to zero and use the Frequency to manually create wide filter sweeps or use an expression pedal for unique wah tones. Adjust the intensity of one filter to taste and use an expression pedal to sweep the second to create some awesome moving center point phase effects. You can also create some very vocal sounds by using the LFO to control both filters and fine tuning the resonance, intensity and master frequency.